Content marketing attracts new readers and book buyers. If you are a self-publisher of ebooks and print on demand paperbacks and want to sell books, you should consider using content marketing as a means to build an audience and to sell more books. The mindset of content or online marketing is something that can be difficult to grasp at first, but with a little research and planning, devising a digital or online marketing strategy, or marketing campaign, is not very difficult. It is now a very common way to promote all types of products or services online. The days of succeeding at selling ebooks with only social media networks like Facebook and Twitter and a free blog are well and truly over. Why? Because once you have told all your Facebook friends, Twitter followers and blog subscribers about your books, over and over again, that is the end of your book marketing reach, and perhaps even of a few friendships. What you need to succeed in selling more books, is to regularly find new people, who can then discover your books. The way to do this is with content marketing. Selling ebooks starts with thinking about digital or content marketing. So what do you need to get started with WordPress? In simple terms, you can attract a lot of people (organic traffic) to well written and informative posts by having your content indexed by Search Engines. This is almost always in the form of articles posted on a self-hosted blog. Organic traffic potential is almost unlimited and this is why content marketing is so powerful. Search Engine indexing of free blogs such as Blogger, WordPress (Free) and Tumblr is not as effective, so they are not the best means of attracting search traffic and increasing brand awareness of your books. Therefore, most bloggers who are serious about content marketing use a self-hosted WordPress site. The key to successful content marketing is to decide on your blog’s subject. Narrowly focused blogs work best, as they establish you as an authority on your topic. A blog with posts covering a multitude of topics, or worse, rants, will fail miserably because readers want a consistency of advice, information and most importantly, solutions to their problems. You probably do the exact same thing yourself, so with this knowledge, you have the first clue to a successful content marketing strategy. Answer questions, inform, and you will find that search (organic) traffic will soon be heading to your blog. If you are focused on creating a valuable resource for readers, you are heading in the right direction. Know your target audience and create content that will be of value to them. Another other reason to use a self-hosted blog is that there are so many tools, functions, plugins and most importantly, money making opportunities, which can offset the small investment you will need to make in launching your own blog. Free blog sites use advertising to fund their platforms, so why not do the same yourself and have complete control and freedom over your blog and its income potential? Even a relatively new blog with modest traffic can usually earn enough from Google Adsense alone to cover the annual hosting costs of a self-hosted blog. In my case, this monthly revenue now sometimes exceeds my book royalty payments. Without a doubt, WordPress is the number one blogging and website creation software, so it’s a no-brainer to use this free open source platform. However, for those totally new to WordPress, it can be a learning curve, especially when it comes to undertaking the initial installation. The easiest way to get up and running with WordPress is to use a host that does all the hard work for you and can automate your installation. Most of the top web hosting providers now offer a one-click install of WordPress when you sign up for a new hosting account. So it is very easy to get started. When your installation is complete, you have your WordPress site! The next step is to choose your blog’s theme. 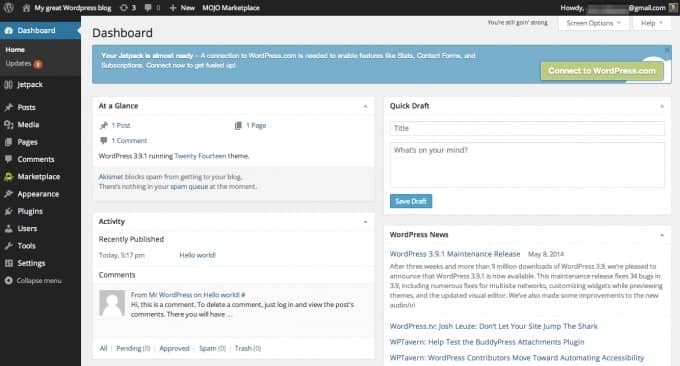 While WordPress supply a free theme, there are thousands of other free themes available. However, many have limitations, or worse, are a bit buggy. It is always best to go for a top quality professional, responsive theme, which will work and look great on all devices. Remember that what might look great on a laptop, could look awful on a smartphone, and considering that over 50% of people access the Internet on smartphones now, having a responsive mobile site is vitally important. Now that your new site is installed and looks beautiful, it’s time to start blogging and learning how to leverage your content to acquire traffic. The best place to learn about using WordPress is WP-Beginner, a site totally dedicated to learning how to use, problem solve and make the most out of WordPress. There are hundreds of other sites that offer WordPress help and advice, and a quick Google search will almost always find the answers to your questions. As far as functionality goes with WordPress, there are a few plugins that I regard as absolutely essential tools. Here is my little top 5 list. All In One SEO Pack. This plugin simplifies and optimises your WordPress blog for SEO (Search Engine Optimization) and creates an XML sitemap for Google and Bing. Google Analytics Dashboard for WP. This Google Analytics for WordPress plugin enables you to track your site using the latest Google Analytics tracking code and allows you to view key Google Analytics reports on your WordPress dashboard. Revive Old Post. A must-have plugin to share your old posts on Twitter, Facebook, Linkedin to get more hits for them and keep them alive. There is a pro version of this plugin, but the free version is great for recycling your content on social media. Updraft Plus. This is the very first plugin I install on a new site. It is a professional backup plugin that automatically stores your WordPress site backups to an external location such as Google Drive or Dropbox. Grammarly. This is not a plugin, but it works seamlessly with the WordPress editor. It is a premium grammar check that will ensure that your text content is of a high standard. There are many more plugins that can add almost limitless functionality to your WordPress website, so it’s up to your imagination as to how best to use your site to leverage your content marketing and attract new potential readers, and buyers, of your books. Apart from all the things I have listed above, the most important element in successful blogging and content marketing is to create high-quality content. Look at a few blogs in your subject area and see what they are doing. You could even consider video content. Content marketing is about providing 95% valuable information, and 5% about marketing your books, or any other products. However, you will be surprised how effective your content marketing efforts can be when it comes to finding new readers and selling more books. I made the change to my own self-hosted WordPress websites years ago and have never looked back. Sure, the first few months were a learning curve, but once I grasped the basics and learned that great content wins anytime over any SEO tricks in getting indexed in search engines, I was up and running. Having my own blogs have become an extension of my writing, which I now enjoy almost just as much as writing a new book. As you can see from the type of content of this post, which is an example of content marketing, I have a couple of affiliate links, but more links to useful resources. There is also no mention of my books. it is seen often enough to generate sales. On occasions, I add a small image link to one of my books, such as the one here on the right, because it gains more attention in an article than if I placed it in a sidebar. This article runs to around 1,400 words, which is about the right length for an informative article on any subject. It also obeys the 95% rule, which means that even though I have added two affiliate links, and one little book ad, 95% of this article is of informative value. Well, at least I hope it is. So good luck with your move to a self-hosted website, and in using content marketing to boost not only your book sales but also in discovering other side income streams that are possible from blogging. Further reading: How to start a blog. Is Your Book Description Killing Your Sales? This is a wonderful article. Content marketing is by far one of the most effective ways of finding, gathering, and engaging your audience. It’s all about giving them as much value, while keeping them engaged enough to buy your book. I write about marketing in the publishing industry and cover this topic extensively. My new book is focused primarily on content marketing, so naturally, this article caught my eye. .
By creating engaging content that puts our brand in focus, we establish authority, credibility, and authenticity that allows us to create a relationship with the reader. This is a wonderful post. I’m loving what you’re doing with your website! Thank you, Andrew. I am happy to hear that you enjoy my blog, and for the compliment! And you are so right about giving readers a reason to listen.